Want to know what happens when you add more taco seasoning than chili powder to your favorite chicken chili?! It becomes Chicken Enchilada Chili. The key is making the enchilada sauce first, before dumping in all the chili ingredients. Prep the sauce…which becomes the base for the chili. 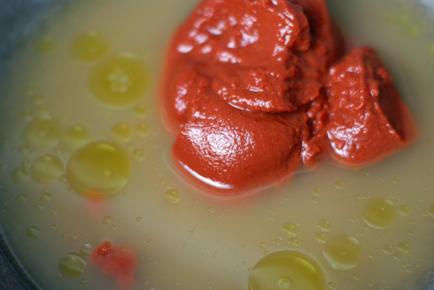 Beef broth plus 1 can of tomato paste, plus some water. Three times the taco seasoning than chili powder (which is hiding underneath). 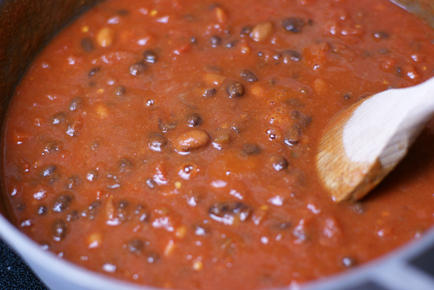 Dump, toss, stir…however you roll…add the red beans, black beans and diced tomatoes with green chilies. Stir in the chicken. And let ‘er simmer. Zippy, zesty, zing! This triple-Z chili will certainly warm your tummy, and your tongue, this fall!!! 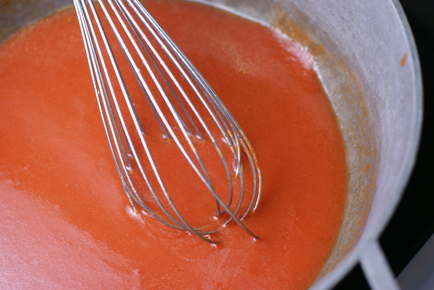 In a large saucepan or Dutch oven, whisk together the beef broth and the tomato paste, plus about 1 cans worth of water. 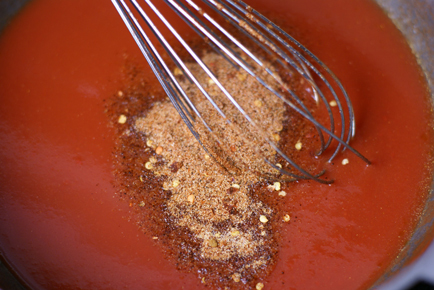 Stir in the homemade taco seasoning and chili powder. 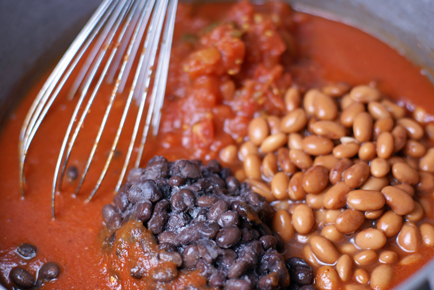 Add the red beans, black beans and canned tomatoes with green chilies. Stir through and let simmer for 10 minutes. 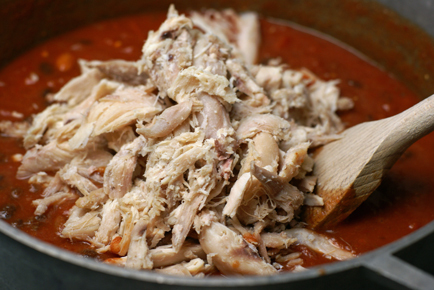 Stir in the cooked and shredded chicken. Let simmer a little longer. If longer than 15 more minutes, cover to prevent too much liquid from escaping. 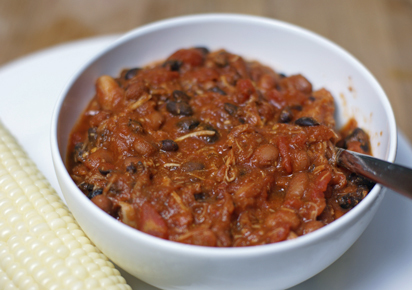 Serve Chicken Enchilada Chili with veggies. Is this spicy (hot) in any way? You typed “zippy zesty zing”, so I just don’t know! We love chili, and only ever buy it. 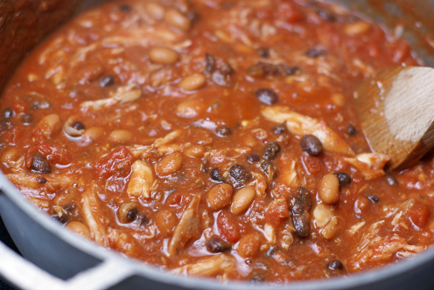 Hormel Turkey Chili with Beans is totally mild. We tried the newer brand Wolff (at Meijer, placed next to the Hormel cans) and it was too spicy for us. Taco Bell’s mild sauce packet is too spicy-hot for us LOL! You control the spice level with what spices you put in! @Beth–the Rotel (aka diced tomatoes with green chilies) is what gives it the most bite because of the green chilies. If you can’t handle Taco Bell mild sauce I suggest you substitute out the Rotel for an equally sized can of regular diced tomatoes. You should be fine then. Having said that, I made this tonight and we loved it. I was a little concerned that it might be a little too spice for my elderly father but he ate more of it than he usually does of such things (even if he had to stop and blow his nose a few times). The only things I did different was add a can of corn to it since we didn’t have any corn on the cob and I thought it might temper the spices a little for Dad, I added 1 tsp of garlic because my hubby asked me to (not that I think it made a difference but it made him happy) and I made it in the crockpot (on high for 3 1/2 or so hours). Having it in the crockpot made it more soupy (I also didn’t shred the chicken, just chunked it since it was still a little frozen so that may have added to the soupiness) but it was very, very, very tasty. There’s a bowl left and I’m hoping my hubby doesn’t take it for lunch tomorrow…..THANK YOU THANK YOU THANK YOU!